There is so much to see and do at Bondi Beach. From surfing lessons to swimming, sunbathing or watching the now famous Bondi Rescue lifeguards at work, it’s a guaranteed day where there’ll never be a dull moment. And you don’t have to head home as the sun starts to go down either. Bondi Beach is not just one of the most famous beaches in the world because of its beauty – it’s also got plenty of restaurants, bars and clubs which start to buzz at sunset. Take a surf lesson – A great thing to try a Bondi Beach is surfing. If you’ve never done it before, don’t stress. There are plenty of surfing lesson options you can take to suit your specific skill level. And what better place to have your first ever lesson? Go shopping – Even if the weather doesn’t permit you to spend a full day in the sun on the sand, it’s still worth visiting Bondi. With so many little designer boutiques plus loads of iconic brands it’s a great place to work out the credit card while enjoying the view. Bondi to Coogee coastal walk – This is a well-known walk that passes several beaches along cliff tops and shorelines, making it the ideal spot to get some stunning photographs of the coast. Dining at Bondi Beach – Bondi Beach has fast become a trendy hot spot for cafes and restaurants catering to a range of different clientele. You’ll find everything from high end dining to delicious pub cuisine and there’s plenty of popular restaurants that cater for people who are vegan and gluten intolerant as well. Swim and soak up the sun – Of course, no trip to Bondi Beach is complete without going for a nice long swim. Relax and enjoy a good book while you sunbake (lathered in sunscreen of course) before diving into the water and cooling off. 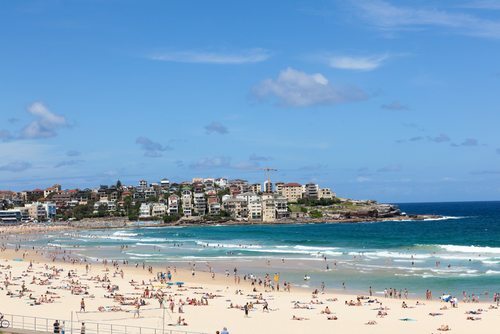 No matter what you decide to do on your visit to Bondi Beach one thing’s for sure. Once you’ve experienced everything it has to offer, you’ll be making plans to come back!